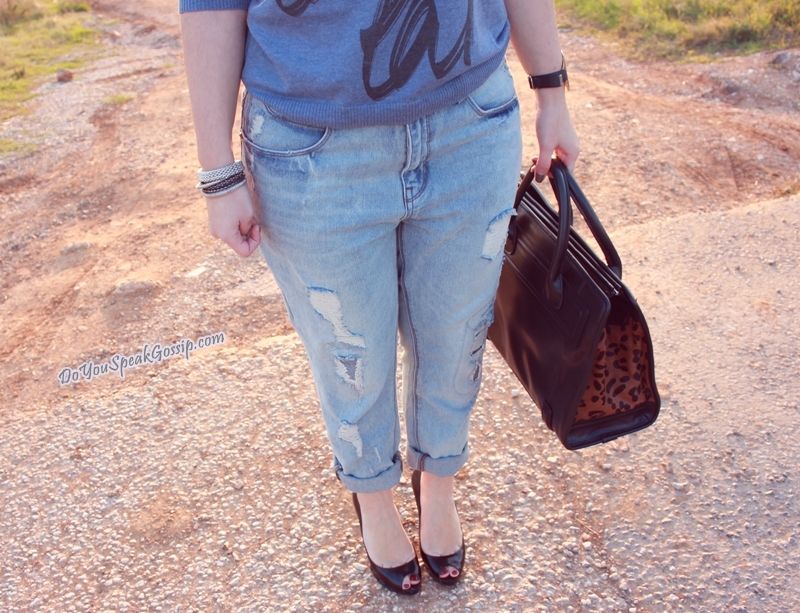 Got my boyfriend jeans on – Outfit post - Do You Speak Gossip?Do You Speak Gossip? I couldn’t wait to wear my new boyfriend jeans, since I bought them…I have so many outfit ideas on my mind, but I decided to wear them this way last week, for an afternoon out with T. He agreed to take some photos of me this week, so I can have some outfit posts to show you while we’ll be in London (we’re leaving this Friday night!). I was afraid to embrace this style because of my curvier lower body, but I love baggy/boyfriend jeans so much, that I just couldn’t help it anymore. The jeans are less baggy on me, but they’re baggy enough, and very comfortable. Blazer: Naf Naf, Top: Stradivarius, boyfriend jeans and bag: Zara, heels from Spartoo.gr: Guess, sunglasses: Ray Ban folding wayfarers, necklace and bracelets: H&M, watch: Calvin Klein, nail polish: Chanel Particuliére 505. I really like the combination of boyfriend jeans and high heels. I like the contrast between casual and formal style which is achieved by the addition of, not only the heels but also the asymmetrical blazer. These shoes were already saved on my birthday with this outfit. I really enjoyed this little shoot we had, and the outfit I wore. There were so many photos I liked that I couldn’t choose. I hope you like it too! I’ll be waiting for your comments!!! Don’t forget to take part in the eyeSlices giveaway. It’s international and ends on Wednesday the 21st at 00.01 EST (07.00AM Greece’s time). Use the Rafflecopter widget at the end of that post. You can read my eyeSlices review here. katoula recently posted..Shopping thoughts…and a mini GIVEAWAY! Thank you Katoula! I really liked taking photos in this light. And thank you for your wishes! I hope we have a great time in London! I’ll take as many pics as possible. My dear you look fantastic!! !Love the sweater and that amazing necklace, love the BF jean and shoes! The bag you know already!!!! Polli koukla kai me fovero stil! sou paei poli auto to casual chic!!!! Mporei na eisai super apasxolimeni kai kourasmeni alla panta eisai kalontimeni, freskia kai xamogelasti sta posts sou! Mas ftiaxneis to kefi m’auto to xamogelo! Perimenoume ta epomena post sou! love bf jeans! you rock them! Hey M! Love this outfit, it looks both stylish and comfortable which is hard to achieve. I am so fed up of seeing people squeezed into skinny jeans that are clearly a size too small with there muffin top hanging out so it’s refreshing to see someone in comfy loose fitting jeans and still looking good! (don’t get me wrong, I have a muffin top of my own, just try to keep it covered up!) The photos are lovely too so well done to T! Thank you very much Laura! I was going for stylish and comfortable, so I’m glad I managed to achieve it. I was afraid to wear this pants, because I didn’t know if they would flatter my silhouette. I hate muffin tops too! Of course I’m trying to wear loose tops when I’m wearing tight jeans to keep everything nice and covered up! Not fully ready yet, but I’m trying to be. I’m so happy that the city will be in Christmas mood already! I love Christmas! S’euxaristw poli! Kai mena me takounia mou aresoun! Eidika sto diko mou swmatotipo….An eisai psili kai adinati, aneta ta foras kai me flat. Fovero tzin! Agapimeno komati kai sou paei teleia! Thumbs up! 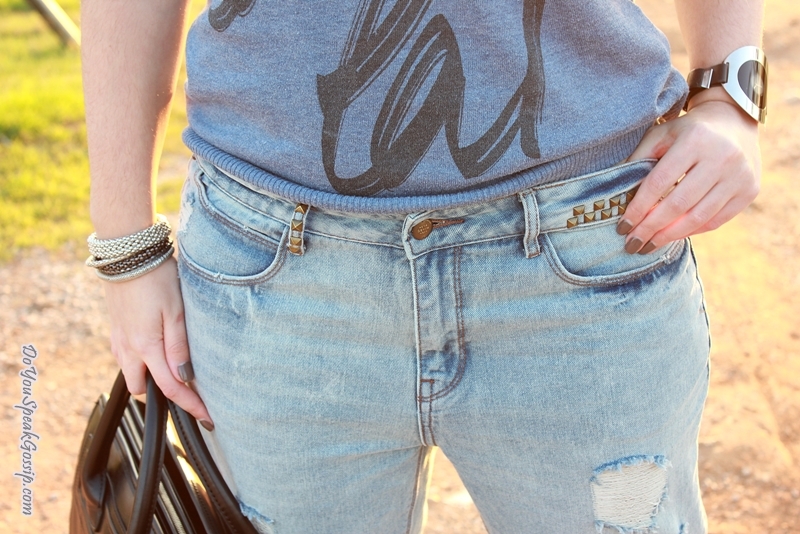 Love a good pair of boyfriend jeans! It’s my first pair of bf jeans! I was contemplating on whether or not to buy one (because I wasn’t sure it would be flattering on me), but I just couldn’t do without it anymore. υπέροχος φωτισμός,μου αρέσει που το συνδύασες με τακούνια (αχ,τα bf jeans δείχνουν τόσο καλύτερα έτσι,ποτέ δε θα το δοκιμάσω σνιφ)και θέλω τώρα αυτό το τοπ! To top distixws einai apo persi ‘i propersi…. ΠΟλυ ωραια συνδυασμενο με αυτη την μπλουζα και το κολιε! love these photos m, they are getting so good! did t take them, the light is absolutely beautiful!! Thank you very much Stephanie! That’s a great compliment, coming from you. You always have amazing photos on your blog. Yes, T. took these photos! I picked the spot, and the time for them. hehe I really liked the result, and I think the light in the pics went nicely with the outfit. Love these jeans!!! And I really like the T shirt with the statement necklace!!! Amazing result! I really like the look! The jeans look great and the necklace is gorgeous! Uuuuh you’re going to London, so cool! Have a great time! Yes, I entered the giveaway with the Rafflecopter widget, don’t worry about me 🙂 Fingers crossed now! Yes, I’m leaving for London in 3 days! Excited but stressed as well. I hope we do have a great time! I really love this look on you – it’s so casual and comfortable looking, but the heels and blazer really kick everything up a notch, too. I actually bought a pair of boyfriend jeans a few weeks ago (although mine are narrower and with no distressing) but so far I’ve just worn them around the house – for some reason it just doesn’t look right on me, although perhaps when I can go back to wearing my favourite shoes in the spring again I’ll have more success! Love the sunlight in these photos, too, it’s so wonderful to see with all of the dark, gloomy weather we have these days! Thank you Amber! I was really going for what you described! So I’m glad I achieved it. I’m sure that the boyfriend jeans would look great on you! Try them with a pair of high heels and you’ll feel great. You have the perfect figure for them! I wasn’t sure if they were for me, and I’m still not sure, but they are really comfortable, and they can look good if you style them with more feminine pieces. These pics were taken a few days ago! Now we have dark days, and cold and rainy weather too. And as if these weren’t enough, we have strong winds too. I hate this weather. Maybe it’s preparing us for the upcoming trip to London. hehe. mporw na pw apo ta agaphmena mou!mou aresei poly o syndiasmos pou exeis kanei! S’euxaristw poli gia ta kala sou logia Evi! Na’sai kala! Poli xairomai pou sou arese to outfit kai oi fwtografies. Τι ωραία εμφάνιση! Μου άρεσε πολύ το τζινάκι, τα boyfriend jeans τα προτιμώ συχνά και τα λατρεύω. Συνδιάζονται με όλα και τόσο εύκολα. Και είναι τόσο χαλαρά…ειλικρινά τα λατρεύω. Πολύ ωραίος ο συνδιασμός σου κοριτσάκι. Κουκλίστικο! Φιλάκια πολλά! S’euxaristw poli Christina mou! Ithela poli kairo na agorasw boyfriend jeans alla den evriska to katallilo zeugari…kai episis den ixera an tha pigainoun sto swmatotipo mou! Den einai teleia panw mou, alla einai toso bolika kai omorfa pou mporw na to paravlepw. Kserw oti tha prepei na to foraw me takounia gia na deixnei kalo panw mou, alla den me peirazei katholou! Τέλειο, τέλειο, τέλειο το Look! Μου αρέσουν όλα head to toe όπως τα συνδύασες! S’euxaristw paaara poli Katerina! Xairomai pou sou arese! Pingback: My month in pics – November 2012 | Do You Speak Gossip?